Customers who visit older University applications or websites may need to run them in Enterprise Mode for Windows. Enterprise Mode, a compatibility mode that runs on Internet Explorer 11 on Windows 8.1 Update, Windows 7 devices, and Windows 10, lets websites render using a modified browser configuration that’s designed to emulate either Windows Internet Explorer 7 or Windows Internet Explorer 8, avoiding the common compatibility problems associated with web apps written and tested on older versions of Internet Explorer. Enterprise Mode allows IT Professionals to target specific websites that may need to run with certain compatibility mode setting. These websites can be defined in a Site List file that contains the compatibility mode settings that are specific for each website. This allows only the specified websites to run in Enterprise Mode. 2. Create a new key "Internet Explorer" under "Microsoft", then create another new key "Main" under Internet Explorer. Again create another new key "EnterpriseMode" under the Main key. 4. 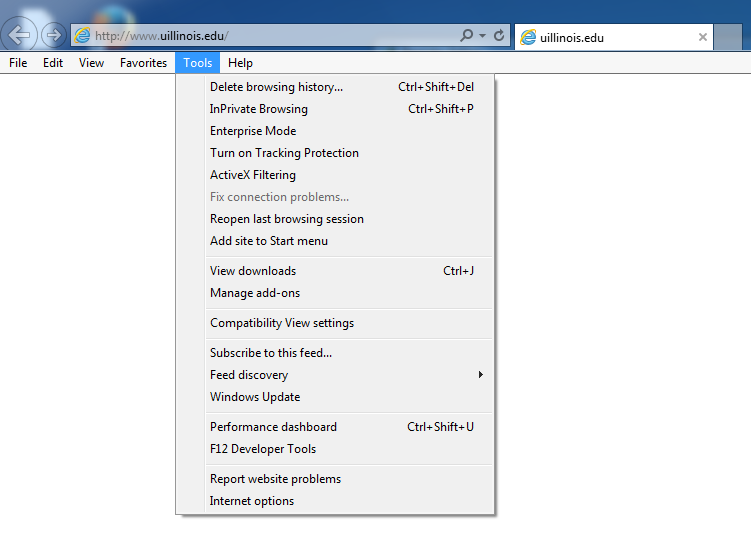 Now when you access IE11, in the Tools Bar, you will have the Option for "Enterprise Mode". To turn on the SiteList for only the local user: Open a registry editor, like regedit.exe and go to HKEY_CURRENT_USER\Software\Policies\Microsoft\Internet Explorer\Main\EnterpriseMode. To turn on SiteList for all users on the PC: Open a registry editor, like regedit.exe and go to HKEY_LOCAL_MACHINE\Software\Policies\Microsoft\Internet Explorer\Main\EnterpriseMode. All of your managed devices must have access to this location if you want them to be able to access and use Enterprise Mode and your site list. For information about how to create and use an Enterprise Mode site list, see Use the Enterprise Mode Site List Manager tool. Turning this setting on also requires you to create and store a site list. For more information about creating your site list, see the Use the Enterprise Mode Site List Manager tool topics. NOTE: Approximately 65 seconds after Internet Explorer 11 starts, it looks for a properly formatted site list. If a new site list if found, with a different version number than the active list, IE11 loads and uses the newer version. After the initial check, IE11 won’t look for an updated list again until you restart the browser. After the list is downloaded, it's stored locally on your employee’s computers so if the centralized file location is unavailable, they can still use Enterprise Mode. NOTE: Enterprise Mode XML SiteList schema v.1 supports Windows 7, 8.1, and 10. Enterprise Mode XML SiteList schema v.2 only supports Windows 10.